It's the Wendy's on 13th and Q that offered a "Scott Frost Special" on Frostys. 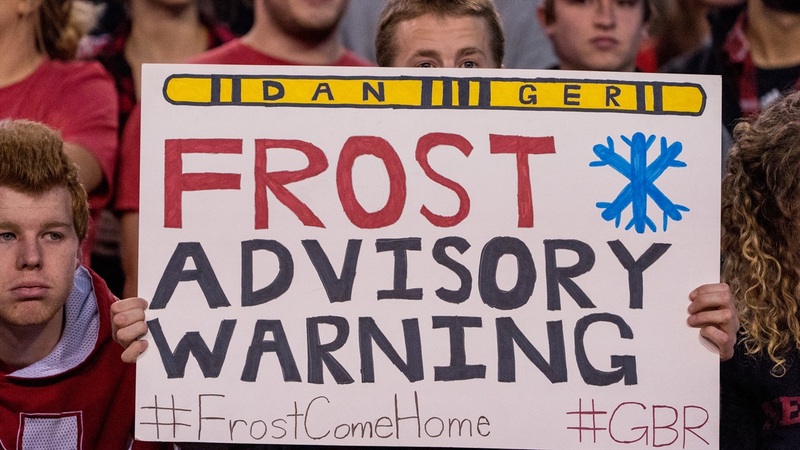 It's the "Frost Warning" and "Frost is Coming" t-shirts hanging in the Nebraska Bookstore. It's the big topic of conversation between family members, friends, neighbors and coworkers. The excitement surrounding Nebraska football is real, and it hasn't slowed down since Frost was hired. That energy has extended beyond the team, too. Take a quick walk around town and you'll hear it. For someone like senior defensive end Freedom Akinmoladun, he knew the excitement was there. It's been entirely different to experience it. It's hard not to get excited when you see the gains made in the weight room, or the crowded running back room ready to compete. Add in a passionate speech from senior offensive guard Tanner Farmer and the excitement level is through the roof. Frost is probably the most even-tempered in all of this. He's not into the whole "offseason excitement" thing, especially when he's overhauling a football program. Offseason momentum is for newspapers and fans on websites," Frost said. But Frost has been here before. He understands the excitement, and he's not wishing it away. He also wants to be mindful of the hype. “There’s several of us in the building that have lived that," Frost said. "This can be an environment where people are talking all the time, an environment where these things can be distractions. I had to learn personally not to read the paper, obviously when I was playing. Praise and blame is all the same, they’re usually both frauds. Neither one of them are probably the truth. You get more blame when you probably don’t deserve it and you get more praise when you probably don’t deserve it. We’ll continue to teach our guys these lessons." Frost isn't the only coach on Nebraska's staff that has lived through that type of outside noise. He has quite a few Nebraska alums on his staff. Inside linebackers coach Barrett Ruud graduated from Nebraska in 2005, offensive line coach Greg Austin graduated in 2006, running backs coach Ryan Held and head strength and conditioning coach Zach Duval both graduated in 1998, and associate athletic director for football Matt Davison graduated in 2001. All of those coaches know what it can feel like to play "in that fishbowl," as Frost called it. That knowledge can be used to educate the current players. Frost doesn't want to eliminate the excitement from his team, though. There's something to be said about the hype, as long as it's kept in check. It sounds like the players are believing it. It's not just Nebraska fans that are hoping for a big turnaround. The players are right there, too. After a 4-8 season, the want to win is great. Can anyone blame the players? Frost can't, nor would he discourage it. There's something to be said about the excitement surrounding Nebraska football this fall. There's plenty of work to be done, and it's not always going to be easy as the Huskers work their way toward their goals. But it's OK to dream big. The excitement in Lincoln, at Memorial Stadium and on this team? It may just turn into something even bigger in time. “I don’t want to just win the Big Ten championship. I want to win the championship. That’s my goal," Farmer said. "You said, ‘is it a realistic goal?’ A lot of people say winning the national championship isn’t a realistic goal. I’m not about realistic. I want it all.